Welcome to Sherwood Forest, a place of mystery and excitement. Band together to oppose the forces of the Sheriff and Prince John in England during the third crusade. Create your characters to do what,s best for England and King Richard by protecting his interests at home. This setting book allows you to lay in the Medieval England of the period of the Third Crusades. There are classes designed specifically for the period. The book is designed to not only emulate the historical perood, but also the mythical one as well. 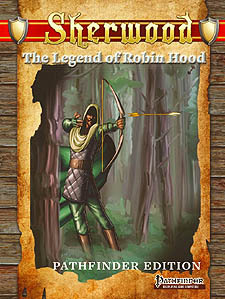 Play inany level you would like from historical to mythical, emulateing vatious novels, stories and tv shows about Robin Hood. This setting can be played in either historical or mythical mose. Historic is more realistic, leaving out magic, but in mythical mode, magic has been added to the setting allowing you to play in the fantastic. In addition to this we have a special type of Action Points called Swashbuckling Points. What these do is allow your character to do the impossible, from swinging on a rope chandelier to climbing up the wall using only a knife. In a style that emulates the early fantastical stories of the genre.